The El Niño phenomenon and the subsequent significant delays in the 2015-16 rainy season have resulted in widespread drought in Timor-Leste. In response, the Council of Ministries nominated the Ministry of Interior to coordinate line ministries for the necessary preparation, mitigation and interventions to support vulnerable affected communities. The Ministry of Interior, with support of World Food Programme, initiated a comprehensive and cross-sectoral needs assessment in early February 2016 in preparation for a coordinated response to the drought. This report presents the results of a Consolidated Livelihood Exercise for Analysing Resilience (CLEAR), which mapped community livelihoods and resilience across the country. The exercise identified 22 different livelihood zones, and assessed their resilience to natural shocks including drought. The report highlights the current impact El Niño is having on the livelihoods of communities, particularly those in Lautem, Viqueque, Baucau, Covalima and Oecussi where the consequences are most severe and over 120,000 people are facing hardships and their livelihoods are at risk. This report* also considers how climate change is expected to develop in the future and what impact it will have on communities. The key findings predict that climate change will impact Timor Leste over the coming thirty years resulting in dryer and warmer conditions. The forecast, using the data available from the Intergovernmental Panel on Climate Change, of which Timor-Leste is a member, raises concerns about the suitability of key crops such as rainfed paddy, coffee, maize and cassava. The report provides a detailed analysis and national maps of factors influencing communities' livelihoods and resilience, including livelihood zones, resilience profiles, income and poverty, as well as a section on El Niño as a key climate risk and its livelihood impacts on communities. The report also gives detailed climate analyses of Timor-Leste in terms of rainfall climatology, rainfall trends, the start of seasons, future climate and crop suitability. These are reported in accessible maps and tables (see examples below). The methods used for the mapping and resilience analysis as well as livelihood profiles are detailed in the annexes. Despite being a relatively small country, livelihoods in Timor-Leste are diverse owing to a complex topography and the bimodal rainfall pattern in the southern coast. 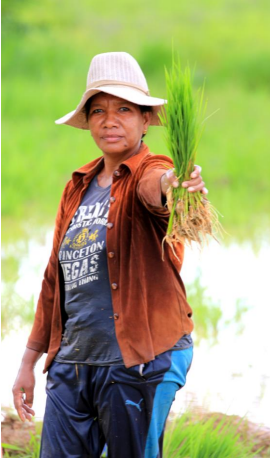 Climate resilience in Timor-Leste is mainly influenced by three key factors: wealth (access to income), livelihood diversity (to better manage shocks), and climate-sensitivity of income (reliance on climate-sensitive cropping systems renders households less resilient to climate variability). Generally, livelihoods in the eastern, northern and Oecussi zones have the lowest climate resilience (due to a combination of low income levels, low livelihood diversification, and high sensitivity to rainfall changes) while those in Dili, Atauro and the southern coast have greater access to diverse livelihood options and are therefore more resilient to climatic shocks. The recent El Nino severely impacted livelihoods, particularly in the eastern zones, where communities reported multiple crop failures and severe livestock impact (including livestock death). However, as of mid-2016 this had not yet translated into a food security crisis. In future, livelihood interventions with respect to the impacts of El Nino events should focus on the provision of maize seeds, ensuring the availability of water and on livestock support. Scaling up of existing social protection structures could be considered as an additional support measure. In response to El Nino events an in-depth multi-sectoral household assessment leading up to the harvest season in the eastern areas (April-May) should be considered. In these months, some households might run out of food stocks and priorities will be better identified. The situation during the recent El Nino changed rapidly on the ground. During such events, rainfall patterns and household food security conditions should be monitored closely in case conditions deteriorate. A number of assessments are taking place simultaneously. Coordination of all information will be essential to ensure appropriate information flows. This report is published jointly by the Ministry of Interior and the UN World Food Programme recognising the important contributions from the Ministry of Agriculture and Fisheries, the Ministry of Social Solidarity, the Ministry of State Administration, the Ministry of Commerce, Industry and Environment, the Ministry of Finance and warmest thanks to the contributions of the Government of Sweden through C-ADAPT. The production of this report has been made possible thanks to contributions of the Government of Sweden through C-ADAPT. C-ADAPT is a strategic global initiative that aims to strengthen the capacity of WFP and partners to deliver climate services to the most vulnerable and food insecure communities and build resilience to climate-related risks through effective climate risk analysis, adaptation planning, and risk management. C-ADAPT is funded by the Government of Sweden’s fast-track climate finance.